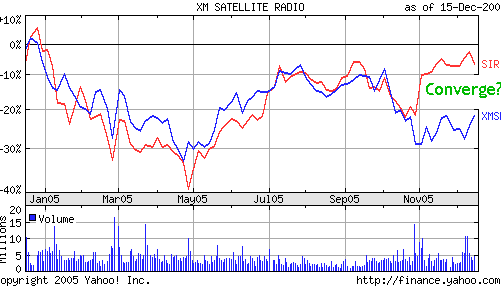 Jeff Matthews has a quick and dirty analysis of XM (XMSR) vs. Sirius (SIRI)valuation and makes a very simple but surprising observation – Sirius subscribers are valued 3x more than XM subscribers. Satelite radio gets him excited but I think the iPod/subscription music approach will kill it off. However, his analysis does create a classic ‘convergence’ hedging opportunity. Sirius has 1.3 billion shares outstanding, $1.1 billion debt and $900 million of cash, according to my Bloomberg. At $7.00 a share this yields and enterprise value of $8.9 billion. That’s roughly $2,965 per subscriber based on Sirius stated forecast of hitting 3 million subscribers by the end of this month. XM, meanwhile, has 222 million shares, $1.1 billion of debt and $750 million in cash, giving it an enterprise value of $7 billion at the recent $30 share price. That’s $1,160 per subscriber based on the forecasted 6 million subscribers at year-end. 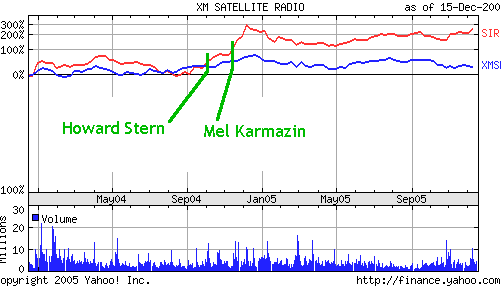 Despite having a higher fixed cost base with the Howard Stern and NFL content deals, plus less desirable satellite coverage than XM (Sirius needs another satellite to ensure complete coverage in event of a failure), Sirius trades at almost three-times the per-subscriber valuation of XM. Is a Sirius subscriber worth three-times an XM subscriber? I wonder how many people already sniffed this out and put the requisite hedge in place? Let’s look at the last year. I don’t know enough about these stocks to account for the big gap in the last 2 months, but it didn’t create the 3x valuation gap. Other than that there is good correlation. Let’s look further back. Bingo, we see around a 3x valuation gap form in the fall of ’04. What happened in the fall of ’04 to create a 3x valuation gap? Howard Stern’s arrival was announced October 4th 2004. Mel Karmazin was November 18th 2004. It looks to me that the gap really formed once Mel was on board. Jeff Matthews found something interesting all right, but got the cause wrong. The chart tells us that the 3x valuation comes from management, not Stern. If you don’t think Mel makes Sirius worth 3x more a subscriber, play the convergence. The real question – outside of the convergence play – is a satelite radio subscriber worth this much? An NPV analysis would indicate that paying $1160 for an XM subscriber today assumes you will continue to see a stream of $13 a month in earnings (XM realizes $13 a month in revenue) for the next 10 years just to realize a 6% ROI. Obviously, people are expecting satelite radio to increase it’s average revenue per user (ARPU), though I have not seen any ideas on how this ARPU is supposed to grow. Or, people are assuming that the market for satelite radio will be much bigger at these ARPU levels than it currently is. Remember Karmazin is a master at ad sales. I heard that they might be looking to generate 600 million in ad sales. The bet here is that they grow the subscriber base to 10 million, with the sweetener of the same ad sales Karmazin had which allowed him to acquire CBS and then VIacom. In my book, this is not just about subscribers.